I’m a fan of dark chocolate and prefer dark over milk or white chocolate any day. After all, there are more benefits in eating dark chocolate, which justifies eating more of it, right? 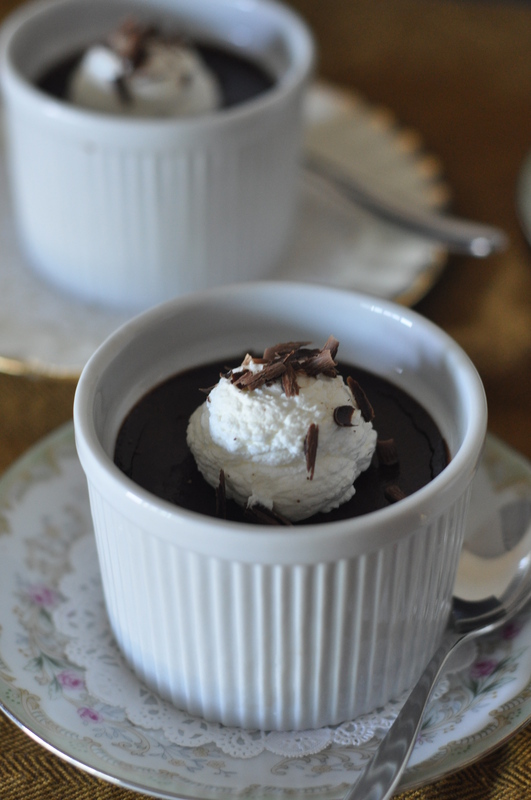 Warning, if you’re making Pot De Creme, be patient- there’s a baking and chilling process involved, which usually means you make it today, and won’t enjoy it until a few long hours later or until the following day. I made mine late at night and chilled it overnight and by dinnertime the following day, dessert was patiently waiting. 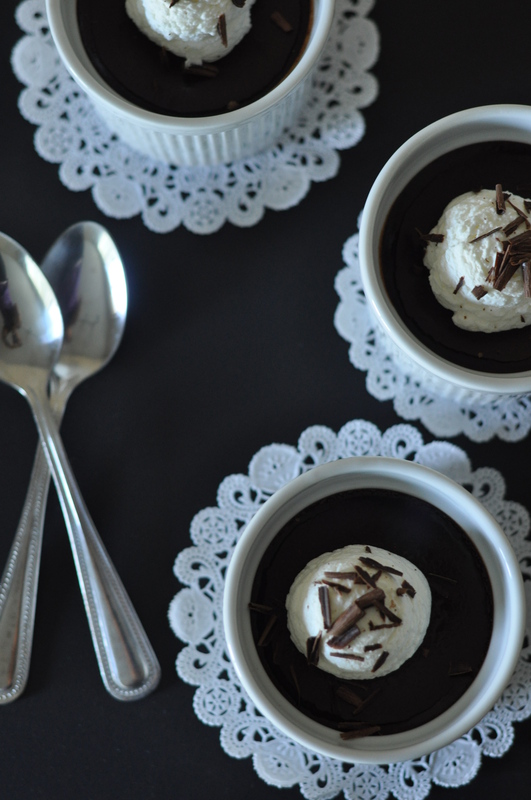 Since this can be a rich dessert, I suggest using smaller ramekins to get the right proportion; otherwise, you will get chocolate-wasted. 1. In a saucepan, bring cream, milk, espresso powder, vanilla, salt to a boil. 2. Place chopped chocolate in a bowl. Pour heated milk mixture over chocolate. Whisk until smooth. 3. In a separate bowl, whisk together yolks and sugar. 4. Carefully add the melted chocolate mixture to the egg-sugar mixture, whisking constantly. 5. Strain the custard into a clean bowl. 6. Divide custard evenly into ramekins. 7. 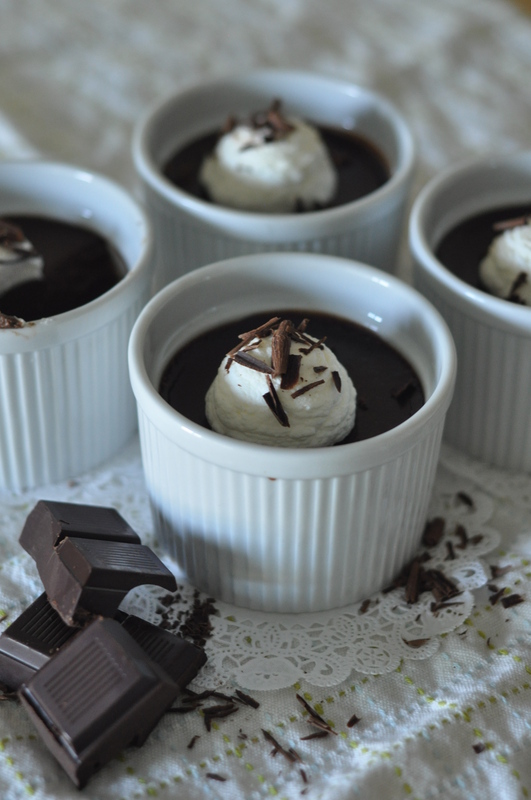 Place ramekins in a roasting pan or a Pyrex baking dish. Fill the pan with hot water until it comes up halfway up the sides of the ramekins. 8. Loosely cover pan with foil. 9. Bake custards at 325F for 30 minutes. Uncover and check custard. Edges should be set and center slightly jiggly. If custards are not set, bake 10-15 minutes longer.